Your article on Tuna wars is a big blow to my belief on the prevailing Japanese fish eating culture on earth because excessive Tuna catching might cause the destruction of the ecosystem. Many Japanese believe that sushi and sashimi are the national pride of the Japanese traditional food culture not only for its tasty and colorful features but also for its benefits to dieting and health. That is why more and more people all over the world tend to try them. Tuna is the very symbol of that proudful food culture. 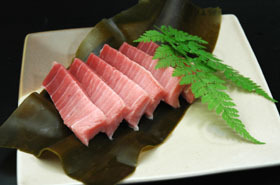 To my regret, however, the more people eat sushi and sashimi, the less Tuna could survive in the Med and other oceans. As the inventor and preserver of sushi and sashimi culture, Japan by all means should take the lead to save Tuna by her intelligence and technology.